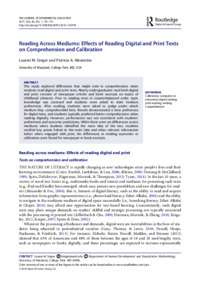 This study explored differences that might exist in comprehension when students read digital and print texts. Ninety undergraduates read both digital and print versions of newspaper articles and book excerpts on topics of childhood ailments. Prior to reading texts in counterbalanced order, topic knowledge was assessed and students were asked to state medium preferences. After reading, students were asked to judge under which medium they comprehended best. Results demonstrated a clear preference for digital texts, and students typically predicted better comprehension when reading digitally. However, performance was not consistent with students' preferences and outcome predictions. While there were no differences across mediums when students identified the main idea of the text, students recalled key points linked to the main idea and other relevant information better when engaged with print. No differences in reading outcomes or calibration were found for newspaper or book excerpts.